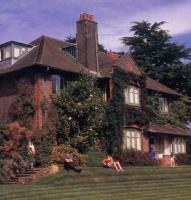 Shaw's Corner was the home of George Bernard Shaw from 1906 until his death in 1950. The atmospheric rooms remain much as he left them, with many literary and personal belongings. The modest house provides a fascinating insight into the domestic life of a literary figure in the first half of the twentieth century. There is a delightful 3½ acre garden with richly planted borders containing Shaw's 6ft revolving writing hut which gave him peace and quiet to write and which he could turn to catch the light. Dogs on leads and only in car park. In village of Ayot St Lawrence. Signposted from B653 at Wheathampstead, and from B656 at Codcote.